﻿ Fun Easy English - new american english grammar topic plural noun. In this lesson you will learn the definition of a plural noun, study examples of plural nouns, and take a test. is usually formed to indicate number by adding "s" or "es"
can be formed by changing the last letter before adding "s"
Plural nouns formed by adding an "es" to the singular form of nouns ending in "ch", "s", "sh", "x"
Plural nouns formed by changing the "f" into a "v" and adding "es"
Note: some just add an "s"
It is very important to make sure the words in a sentence have singular and plural agreement. 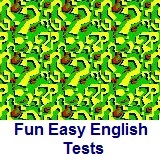 In the following test, choose the correct sentences. a. She is taking less classes this semester. b. She is taking fewer classes this semester. The correct answer is ........ b. She is taking fewer classes this semester. a. That student is always late for class. He annoys the teacher. b. That student is always late for class. They annoy the teacher. The correct answer is ........ a. That student is always late for class. He annoys the teacher. a. That food has a lot of sugars. b. That food has a lot of sugar. The correct answer is ........ b. That food has a lot of sugar. a. Every students was on time for class this morning. b. Every student was on time for class this morning. The correct answer is ........ b. Every student was on time for class this morning. a. This news is very exciting. b. These news is very exciting. The correct answer is ........ a. This news is very exciting. a. There are fewer calories in light beer than regular beer. b. There are less calories in light beer than regular beer. The correct answer is ........ a. There are fewer calories in light beer than regular beer. a. John always gives his wife a lot of jewelry. b. John always gives his wife a lot of jewelries. The correct answer is ........ a. John always gives his wife a lot of jewelry. a. We bought a lot of used furniture at a garage sale. b. We bought a lot of used furnitures at a garage sale. The correct answer is ........ a. We bought a lot of used furniture at a garage sale. a. The new equipments for the basketball team has arrived. b. The new equipment for the basketball team has arrived. The correct answer is ........ b. The new equipment for the basketball team has arrived. a. Mayumi bought a little apples for her lunches this week. b. Mayumi bought a few apples for her lunch this week. The correct answer is ........ b. Mayumi bought a few apples for her lunch this week.